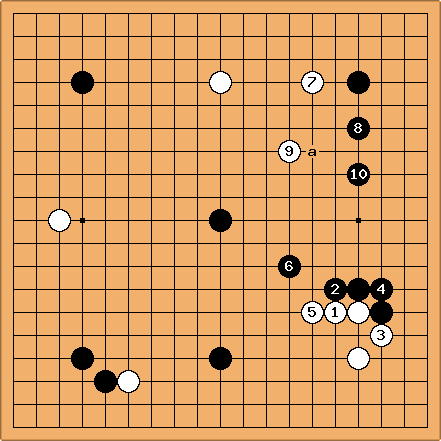 The game below resulted from the discussions about teaching game 53 where Black is receiving a large reverse komi in addition to two handicap stones. Enjoy! Dave: ...I don't really know what is the best way to "plan" playing with or against a 50 point komi. Granted in this case it is to compensate for a significant difference in strength but it is still interesting to consider how White (and Black) should approach the problem. It would be interesting to play a game against an opponent of equal strength with for example a 35(?) point komi in exchange for 3 handicap stones. Dave: 35.5 seems fine for the first try. More generally, what is the procedure to bid between two players to decide komi? I remember reading a discussion of it on rec.games.go but can't remember how it should work. 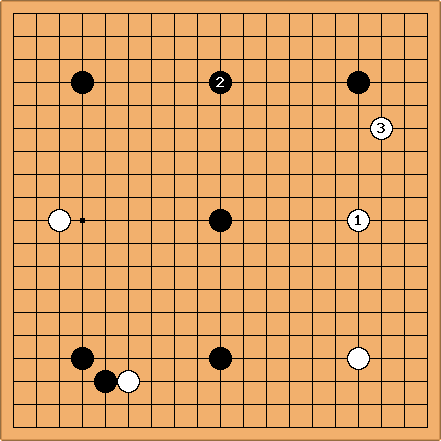 One scheme I have never heard of, but should work pretty well is for one player to set the komi and the other player then to choose whether to play Black or White. SAS: This last system is (or at least was) used in Japan's Strongest Amateur tournament. See http://gobase.org/games/davies/94/94may.html . Dave: White 41: So much for the corner! Dave: White 31: I think that there is enough aji left on the lower side to justify this as a dual-purpose move. If White can't effectively reduce the bottom after this, then it is probably too small at this point. Dave: White 33: The last tidying up before the fighting begins? Bill: Black 34: Aye, aye, sir! Much later comment: Again, I was seduced by a "double sente". Allowing W 37 is OK in that corner, but makes White's upper moyo too secure. Dave: White 39: We will just have to see where this takes us! 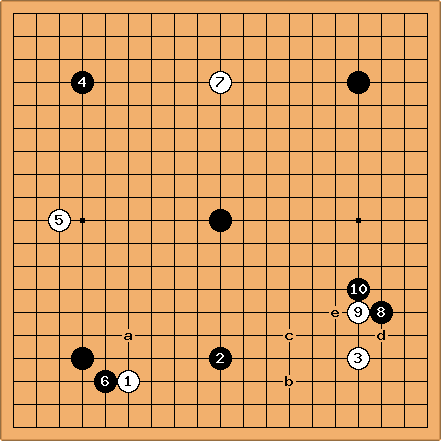 Was the analysis for 37 Katteyomi? Bill: Black 22: Aye, aye, sir! Dave: White 23: Action - reaction. Bill: Black 24: The flow of the stones. Dave: White 25: Trying to limit Black's center potential while strengthening White's weak stones. Bill: Black 26: Still flowing. Much later comment: Better at 29, I think. I thought that W e would be sente, and B 26 close to it. But now I think that B 29 has a better relation to the rest of my stones. Dave: White 29: Strengthening the left. In addition, Black 30 is on the frontier between moyos, enlarging Black's and reducing White's potential expansion. Black d may have been better. It would have been better if it were sente, but Black is too thin and White is too thick for that. Later thoughts: Black a looks like sente. Maybe better to play there first. Dave White 11: Heh, it's a handicap game so why not the traditional handicap-game joseki!? Dave White 13 - White 17: Just following orders! Dave: White 19, I thought a would be too aggressive with the diagonal black wall stretching up to tengen waiting for me. Bill: Another nice play, Dave! Black 20: Stolid play? Bill: I thought about a, but maybe 2 makes better use of the tengen stone. Dave: With 2 the lower right seems to become more urgent than the upper left. If I play Black 1 instead at 3, if now White plays in the other corner, Black 3 works better than in the game, coordinating with both Black 1 and the tengen stone. If White 2 makes a double kakari, I think I can manage to take sente and play in the other corner. Who came up with that nonsense about no plan in the opening? Dave: Hmmm... Yes, this order seems more interesting for Black. I might choose to play a instead of 2 in order to blunt Black's momentum along the left side. But it will still be more difficult to tenuki after 3 than in the game. On the other hand, if I answer 3 then b becomes an awfully good looking point for Black. Black 6: "The time has come, the Walrus said." 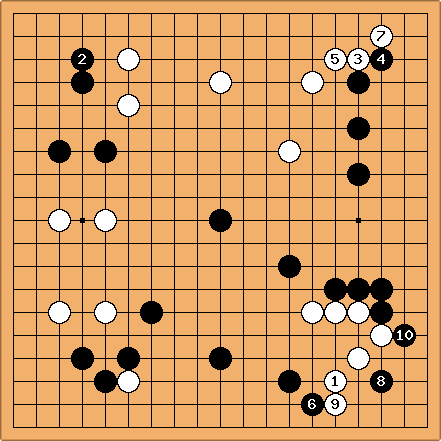 Dave White 7: Following 5 my theory is that I should be able to play tenuki from the lower left, spending some of my komi to break up potential black frameworks. Dave White 9: Sooner or later Black's handicap starts to exert its force. I first planned to answer 8 with a play at b but was afraid of what would happen if Black in turn answered at c.
Bill: Black 10, hane. If you play osae at d, I play atari at e.
If White takes the right side and Black takes the top then the approach move at 3 expands White's side while limiting Black's top. This way White has superior influence in at least one part of the board. 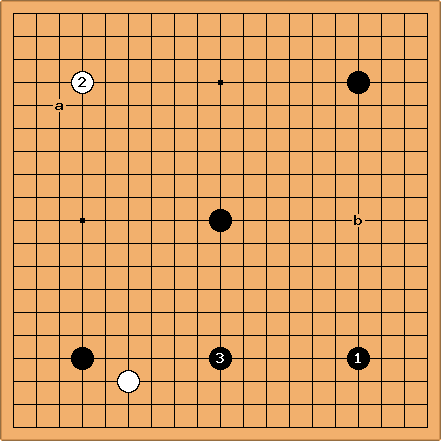 In the game, White's stones are more scattered and it will be a delicate problem to avoid being attacked too strongly.